TowerFall Ascension is a multiplayer arena game first released on the Ouya by the name TowerFall in 2013, then later ported to other consoles and PC. The Dark World expansion pack was released two years later. While focusing on multiplayer, this game features a Trials mode where a single player must shoot targets. The present TAS completes all 48 trials of the game, including ones from Dark World expansion. Below the same video slowed down to 0.25x speed (and still 60 fps). Sorry for the crappy audio. A standard ability, but very important for the following tricks. Pressing the Dodge button while ducking executes a Dodge-slide, which is an horizontal Dodge with a higher velocity than a normal Dodge. The base of most tricks of the game is the ability to cancel a Dodge at any point by pressing the same or another Dodge button (Hyper Dash), or by jumping if the player is on the ground (jump-cancel). When Dodging, the player starts at a high initial speed, then it decreases rapidly. When a Dodge is canceled by another Dodge, the player keeps the Dodge speed, allowing him to move faster than running speed. A Dodge can be canceled on the first frame after the Dodge for the highest speed. A cancelled dodge also enters the cooldown period earlier, allowing the player to execute another Dodge earlier. A Super Jump combines a dodge-slide with a jump-cancel. The player must perform a dodge-slide immediately followed by a jump-cancel. The added momentum from the dodge-slide will propel the player forward into the air a great distance. A Hyper Jump is a Super Jump combined with a Hyper Dash. It's executed by performing a dodge-slide, followed immediately by a Dodge cancel, and then a jump. This method gives the highest momentum boost to the player allowing for jumps of huge distances. This is the best way to gain massive speed and launch yourself across the map, since slides are faster than dodges and air friction is lower than ground friction. If a player possesses wings they can perform a technique that sees them fly rapidly upwards into the air. It is performed by jumping with wings when airborne followed immediately by an upwards Hyper Dash. During a Hyper Jump, holding the arrow button slightly decreases the air friction, but we loose the player control when aiming in the air. Because of the Dodge cancel mechanics, the sooner you cancel the Dodge, the higher speed you gain. As a consequence, a higher framerate gives access to higher speed. The game does not lock the framerate, it depends either on your monitor refresh rate when vsync is on, or your computer processing power when vsync is off. The game engine supports high framerates without any problem. As an example, at a very high framerate (1000 fps), a Hyper Jump gives a velocity 15% higher than at 60 fps. 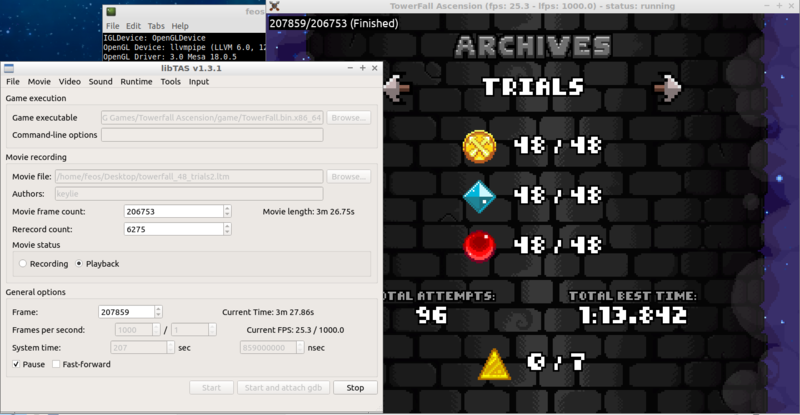 So I decided to record this TAS at a framerate of 1000 fps. This value was chosen for multiple reasons. 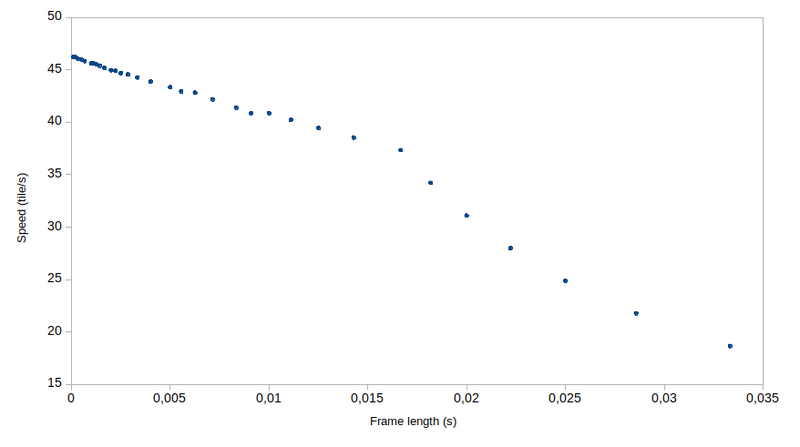 First, the increased velocity is negligible after around 300 fps. Also, the in-game timer is precise to the millisecond, and behaves correctly regarding frame advancing (advancing one frame always increases the timer by exactly one millisecond). This allows us to complete stages at the best precision displayed by the game. feos: Replaced with a movie that uses a code to unlock all the trials. Verified sync on 1.3.3.1 version of the game. feos: Set the branch label that makes it obvious that this movie forces the OS to V-Sync at 1000 frames per second - a value that an original target OS for this game doesn't offer. libTAS intercepts the time functions of the OS and makes the game think that it runs at this framerate, while in reality it's not an option. feos: We found out "1000 fps" is the most correct spelling. feos: Finally, the actual judgment. I don't think this goal can be considered full completion, because there is also a Quest mode of the main game and of the Dark World DLC. I don't know if it makes sense to beat all Quest levels and all trials in a single movie, this would need some discussion whether we count that as full completion or not. This movie also happens to abuse the environment in a way not expected by the developers. This is similar to inserting an NTSC-only game into a PAL console and abusing the resulting glitches. Because the authentic environment the game is developed for is a part of the challenge that the game is. For consoles it just happens to be locked and sealed, and we do not allow to break its integrity. Simply because you can not casually modify your console and then expect legitimacy for your speedrun that abuses these tweaks. But why do we allow it here? Because IMB PC officially has open architecture, and one is expected to build their own PC using whatever compatible (or incompatible!) components they can afford. Yet this obviously doesn't mean that every game can run just fine on any architecture. Quite the opposite: games are usually developed and tested only against a limited set of hardware and software configurations. Those configurations are then announced as minimal, supported, and/or recommended computer specs the game is designed to work on. And on some others (or even some of the intended ones) it may glitch out and become unplayable. So we allow this to some extent, if it can be proven that a game was designed for some configuration, and it was used. But when one uses configuration not even expected by the developers, we try to limit this approach as not entirely legitimate when it comes to blatantly clear speedrun records. We do not allow abusing unintended environment for Vault. And most importantly: we do not encourage anyone to abuse unintended environment at all. This means a movie doing it may be obsoleted by the one that avoids it if there are gameplay improvements otherwise. Here's the post speaking of all the aspects of this problem, and here's what our updated Rules say on that matter. Now, why 1000 fps exactly? The author provided insight on how this game engine works at higher framerates. After some relatively high framerate value, the trick this movie abuses starts saving less and less time, and its usefulness caps out at around 500 fps. This movie also aims for in-game time over real time, and milliseconds are the most precise unit of time measurement its timer can work with. So using higher framerate won't affect the in-game timer, because there's no more speedrun benefit for the trick that needs high framerate. This is still quite arbitrary, but the feedback of this movie is quite positive, so with the about clause on obsoletion, we can allow it here.